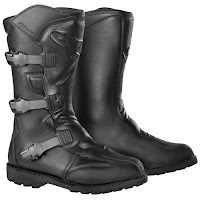 New for 2010, the Alpinestars Scout Waterproof Boots. We got it, we reviewed it, we like it. Check out the detailed video. This boot stacks up really well against any of the best-of-class Adventure Touring boots from other top brands like Sidi and REV'IT!. Featuring a fully leather coated PU outer construction with a 100% waterproof performance membrane, what really impresses about this boot is the innovative double-injected TPU protection in the ankle cockpit Alpinestars utilizes. Basically, the hardness and thickness of the TPU is variable to allow protection and flexibility in one streamlined piece of material resulting in superior safety and comfort. We dig `em. If you want to weigh these against the other options out there, check out our selection of waterproof motorcycle boots at RevZilla.com.